Rolling through intersections too fast to stop and too slow to get out of the way, is a sure formula for accidents. Either speed problem should only be the case if the ambulance is moving faster than what the driver can see coming. Moving too slowly to be able to clear the intersection is going to be a given, if the ambulance is stopped. We cannot always see all of the traffic approaching the intersection before we enter the intersection. Roosevelt Boulevard with a couple of truck or busses in the traffic will prevent you from seeing all of the approaching traffic. If you can’t see them, they probably cannot see you. Clearing these intersections requires moving forward enough to be able to see if traffic is coming through each open lane, which can always change as long as there is no vehicle blocking the lane. I think we could easily cut lights and siren responses and transports by half without anyone being harmed. If your Medics are competent they can handle the care needs for an extra two minutes. In one system I was proud to work in, asking to run hot to the hospital was tantamount to admitting you were helpless to manage patient care. We did use them, but it sure did not happen as often as another system I worked in years later. It does require placing more emphasis on competence, rather than lowest common denominator rules. PA Title 75, Section 3105, Part b: Ambulances, blood delivery vehicles and human organ delivery vehicles.–The driver of an ambulance, blood-delivery vehicle or human organ delivery vehicle shall comply with maximum speed limits, red signal indications and stop signs. After ascertaining that the ambulance, blood-delivery vehicle or human organ delivery vehicle will be given the right-of-way, the driver may proceed through a red signal indication or stop sign. I would reason that most other states have similar provisions and remind that an individual organization has no authority to circumvent the statues of the State. Additionally, here in Pennsylvania (at least some parts) the idea of limiting the use of L&S when responding to an incident and transporting to the hospital is becoming more accepted. Even though it has a been a limited time (and I do not have any studies / statistics to back this up) I personally have seen very little impact on overall response times. That is one of the reasons I used the video I included. If I recall correctly, that is from Philadelphia. If not, there was a very similar collision in Philadelphia not too many years ago. State laws can be changed. Some states, and I think Pennsylvania is one of them, have to change the state law to change the medications in the paramedic scope of practice. Drugs are added, or removed, every couple of years. As you can see from what you cited, Pennsylvania also prohibits ambulances from driving faster than the speed limit when using lights and sirens. The result of enforcement of speed limits would be interesting. This is true, but not all states have the same laws and laws can be changed, just as policies can be changed. I am advocating for both. 2. The use of L&S during response or transport should not be confused with whether a patient had an emergency condition requiring urgent assessment, treatment, or transport by EMS providers. Many patients that require emergency assessment, treatment, and transport may be appropriately and safety cared for by EMS personnel without the use of a L&S response or transport. a. “Stand-bys” at the scene of any fire department-related incident that does not involve active interior structural attack, hazardous materials (see below), known injuries to firefighters or other public safety personnel or the need for immediate deployment of a rehabilitation sector. b. Carbon monoxide detector alarm activations without the report of any ill persons at the scene. c. Assist to another public safety agency when there is no immediate danger to life or health. d. Response to a hospital for immediate interfacility transport. e. Response to a medical alarm system activation. f. Response to patients who have apparently expired. g. EMS agencies should consider whether L&S should be used when responding to emergency requests for EMS at facilities where health care personnel are already available to patients who are not suspected to be in cardiac arrest – for example skilled nursing facilities and medical offices. h. EMS agencies should consider whether L&S should be used when responding to MVCs with unknown injuries. on the patient care report. 2) Critically unstable patient with impending cardiac arrest. c. The vast majority of patient’s will not have better medical outcomes by decreasing transport time by the time saved by L&S transport. d. The patient’s physiologic responses to L&S use (increased tachycardia and blood pressure) may be detrimental to some patient’s medical conditions. 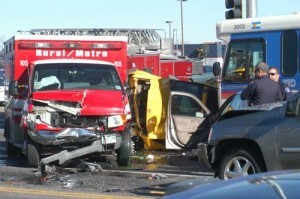 e. When EMS providers are not restrained, the increased risk of EMS vehicle crash while using L&S may increase the risk of injury to EMS providers. The extremely poor prognosis for patients transported with CPR in progress does not justify the use of L&S transport for most patients in cardiac arrest. f. When in doubt, contact with a medical command may provide additional direction related to whether there is an urgent need to transport with L&S. Pennsylvania is doing a lot to apply the results of research on patient care and the transport that can have such a large effect on patient care. Dr. Kupas is doing a great job at dragging us out of the Dark Ages.